International Assistance Dog Week starts this weekend. It was created to recognise all the devoted, hardworking assistance dogs helping individuals mitigate their disability related limitations. International Assistance Dog Weekend website here. There are several charities training and supporting assistance dogs in the UK, for example most people know about Guide Dogs, if you're a This Morning viewer you'll know about Dogs for Good, lovely yellow lab Digby was the programme's puppy with a purpose until July this year, you can read about him here, and have you may have heard and seen the wonderful Caddie an assistance dog for Joel a boy with autism who were the stars of last year's Crufts (more here). There are also dogs to alert when blood sugar levels are wrong (too high or too low), when a seizure is looming, to help someone in a wheelchair by opening doors, carrying and picking up items, the list of things assistance can do for people is truly amazing. Dorothy was diagnosed with Primary Progressive Multiple Sclerosis in 1996 and by the beginning of 2001 she had to retire from work, in 2002 she was introduced to Swift a wonderful, bold, black Labrador who was full of life and keen to learn and work. Very quickly, Dorothy was able to start reclaiming bits of her old life that she missed. “I used to be a keen hiker and went on long walks in the countryside,” she explains. “And with Swift by my side, I started to grow in confidence; enough to begin to explore the great outdoors once more.” Read Dorothy's story here. Both Dogs for Good and Guide Dogs are members of the Assistance Dogs UK a voluntary coalition of assistance dogs organisations. You can tell which organisation trained and provided the dog by their uniform, for example a Hearing Dog wears burgundy, a Guide Dog of course has his harness - but did you know if it's got red and white checks then the person is also hearing impaired? 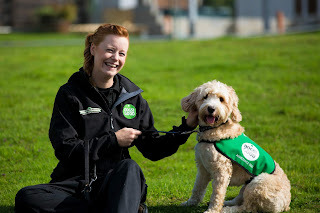 Looking at the uniform can give you clues as to what the dog does and that in turn can help you know how to provide the best assistance to the person should it be needed. This PDF leaflet from Transport for London has a quick guide to the colours and what the dogs do. 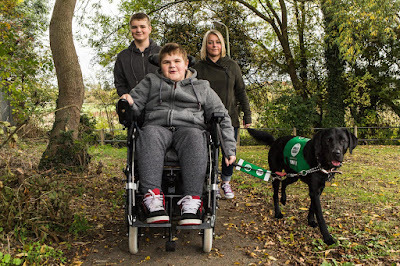 And of course never interrupt an assistance dog when it's working, no matter how cute they look, read this guide on how best to approach an assistance dog and their owner. This is all very nice and they're lovely doggies but what's this got to do with working in the countryside? The law says that guide dog and assistance dog owners have important rights under the Equality Act 2010 (EA). The EA provides for people with disabilities to have the same right to services supplied by shops, banks, hotels, libraries, pubs, taxis and restaurants as everyone else. 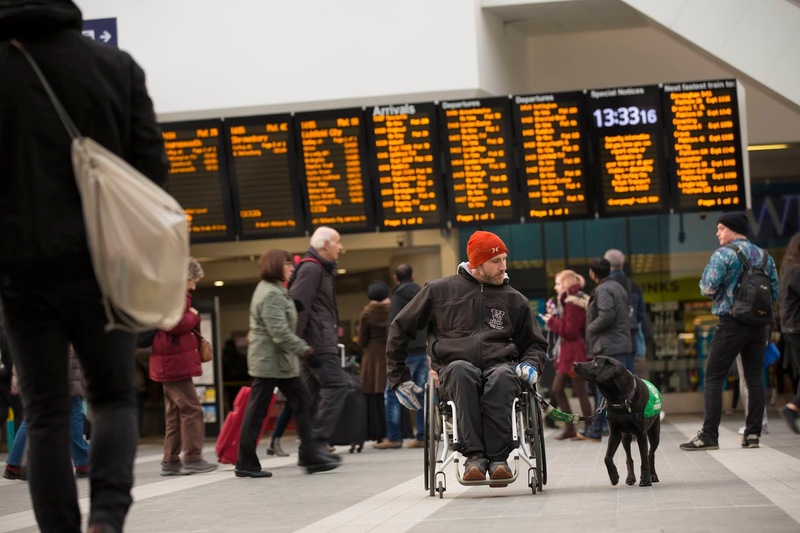 Service providers also have to make “reasonable adjustments” for guide dog and assistance dog owners. In 2004 the law was extended to state that service providers have to consider making changes to “physical features” which make it unreasonably difficult for disabled people to use their services. Have you thought about how well prepared your location is for people with physical limitations or those with other health needs? Most people are aware of the need for wheelchair access but there are lots of other things you can consider. What could you do to make it easier for someone with a hearing impairment: speaking posts and mobile phone apps are great but do you have some good old fashioned signs and leaflets as well? Do you have a lot of noise, background audio and automatic interactive installations in your visitor centre? If so could you offer a day or a few hours when they're turned down or switched off completely for people with sensory disturbances like autism? And what about the dogs (seeing as this all about them)? If you work on a countryside site or manage an area of urban greenspace do you have a dog friendly safe space? All assistance dogs are dogs after all and they all need some off duty time, so if you've got a safe space for the dogs to get their free run you could let people know or even set up a regular event (think of the PR and photo opps you could get out of that!). It's really important that assistance dogs get their down time and a chance to run and play and for their owners it is even more important than for other dog owners that it's a safe space, well fenced and secure, it's not only their beloved pet that getting its exercise but their eyes, ears, hands and lifeline to freedom. And here's a really simple one, could you offer a water bowl and a shady spot for a tired assistance dog? CJS Focus edition published in November 2016 was titled Overcoming Barriers and looked at some of the problems faced by people accessing the countryside and outdoor sites, download the full edition here (PDF). Then take a look around and see what simple changes you can make to your site to make it even more accessible. With thanks to Dogs for Good for the lovely photos. Do you ever think your photos might be useful?